LOOK: Taki gets star strucked with Jennylyn Mercado! Dabarkads Takako Saito also known as Taki expressed her admiration towards Ultimate Star Jennylyn Mercado on her Twitter account, Saturday afternoon when the singer/actress visited noontime show Eat Bulaga to promote her new album 'Ultimate'. She admits to getting star strucked with Jennylyn. Both ladies served as judges in the segment Challenge Accepted of the said noontime show. Check out Taki's tweet below. The RomCom Queen is definitely back! 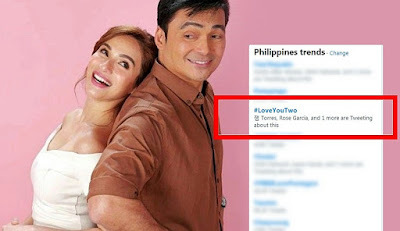 This time, Jennylyn Mercado is pairing up for the very first time with seasoned actor Gabby Concepcion in 'Love You Two'. Directed by Irene Villamor, GMA Network's newest romantic comedy offering will start airing this April on GMA Telebabad. LOOK: Free Car in Every Cup with Dunkin' Donuts!